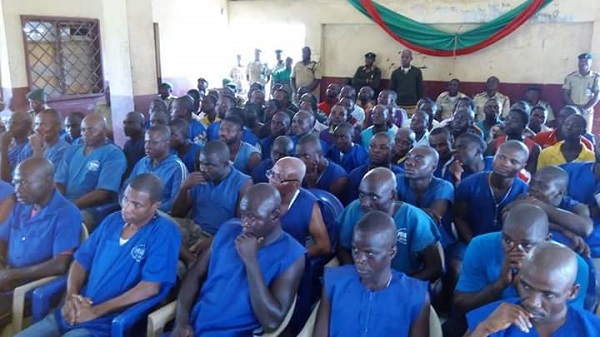 21 inmates at the Ado Ekiti Prison were on Wednesday set free by the Chief Judge of the state, Justice Ayodeji Daramola. The release of the prisoners was a part of the Chief Judge’s first quarter prison visit of the year. He had during the visit interacted with 327 inmates of which 21 were set free. Justice Daramola, speaking on the release, said that the major reason behind the visit was to inspect the living conditions and ensure improved welfare for the inmates. He appealed to the police prosecutors in the state handling cases to file them on time, in order to reduce number of awaiting trial inmates in the prisons. Nonetheless, he commended the prison authorities for taking good care of the inmates and keeping the environment very clean, after inspecting the rooms.